Baby blankets make the perfect gift for expectant parents – they’re soft, wear well, and are made with lots of love. However, if you’ve made two, three, four or more with the same basic, unimaginative pattern, you might want to try something new. 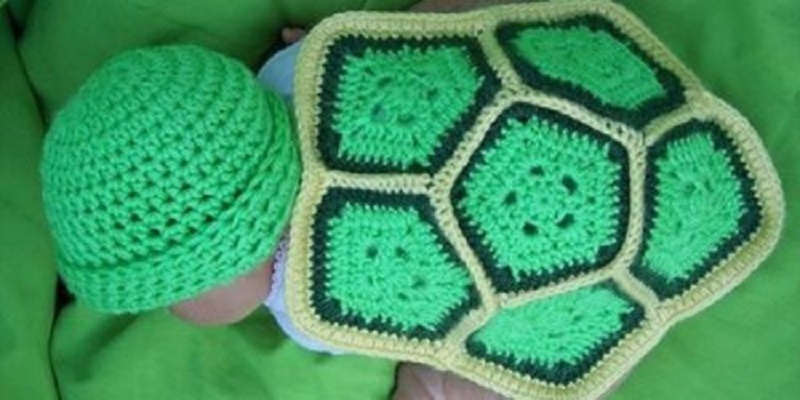 How about this tri-color turtle shell blanket and beanie? The finished look is adorable, perfect for newborn photo ops or a costume party. Labeled an “Easy” project, this blanket-and-beanie duo are quick work with a medium weight worsted yarn (make sure it’s soft and non-itchy! Machine washable is always a bonus too) and size “G” (6) and “I” (9) needles. You’ll also need a pair of scissors and a yarn needle to tie up those loose ends. There aren’t any fancy stitches (the pattern uses slip stitch, chain stitch, single crochet and half double crochet), although the pattern does begin with a Magic Circle. You’ll be using three different colors of yarn (recommended colors are two shades of green and another earthy, natural, complimentary color like brown or yellow) and creating six pentagons to sew together for the shell. The beanie is crocheted separately with one color of yarn, although you could mix it up if you want a challenge. This Etsy listing from Easy Peasy Grandma allows you to purchase the pattern for both blanket and beanie. You can find a similar pattern by Corina Gray for free on the Stitch11 site if you’re looking for something sans price tag.